All Native American mtDNA can be traced back to five Haplogroups called A, B, C, D, and X. More specifically, Native American mtDNA belongs to sub-haplogroups that are unique to the Americas and not found in Asia or Europe: A2, B2, C1, D1, and X2a (with minor groups C4c, D2, D3, and D4h3). Based on the study, the A2, B2, C1, and D1 groups are estimated to have developed between 18,000 and 21,000 years ago. 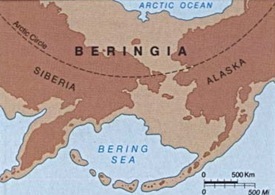 Since the Native American mtDNA sub-haplogroups are not found in Asia, they are believed to have developed while founding groups were crossing into the Americas from Asia via Beringia. The study suggests that 95% of Native American mtDNAs are descended from the six founding mothers of the A2, B2, C1b, Cc, C1d, and D1 sub-haplogroups. The other 5% is composed of the X2a, D2, D3, C4, and D4h3 sub-haplogroups. Genealogy is always a fascinating subject. To think that many individuals ultimately come from only about five people or DNA types, it can be hard to believe.